If protection is a top priority when storing your goods or products, an attached lid tote, or container, is an excellent option. They’re widely known in the industry as one of the most effective, reliable methods of storage. What is an Attached Lid Tote? Attached lid totes, or handheld plastic boxes, as they’re sometimes known, are designed with better protection, stackability and safety in mind. Unlike conventional storage containers, they feature an attached lid, which closes using a secure, interlocking design. Attached lid totes come in a wide variety of shapes and sizes, and are designed to accommodate a wide variety of products. They are generally manufactured from hard-wearing Polypropylene or HDPE. 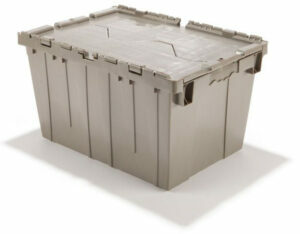 Attached lid containers offer a number of significant advantages when compared to standard forms of storage. Secure lid design. The integrated lid ensures that the lid is never misplaced during transit; which helps to ensure that the contents are never accidentally tipped out or lost. Space saving. All our attached lid totes are designed to allow easy stacking, and all can be nested to save additional space when not in use. Heavy duty material. Each tote is created from hard-wearing, durable materials; which ensures that they’ll last for years to come. They’re suitable for a wide variety of demanding industrial applications. Easy to handle. Each tote is designed to be easy to pick up or stack. Who Can Benefit from Attached Lid Containers? Many industries benefit from using attached lid totes. They’re particularly useful within a warehouse environment, in logistics, removals services and in retail distribution. They’re also suitable for storage of hazardous materials and pharmaceutical contents. If you’d like to find out more about our range of attached lid totes and how they can benefit your business, simply get in touch with the Viable Packaging team today at 813 831 6510.